Economy and Industry Ministry Chief Scientist and Israel Innovation Authority Chairman: Israel known for 'innovation and lack of fear'. 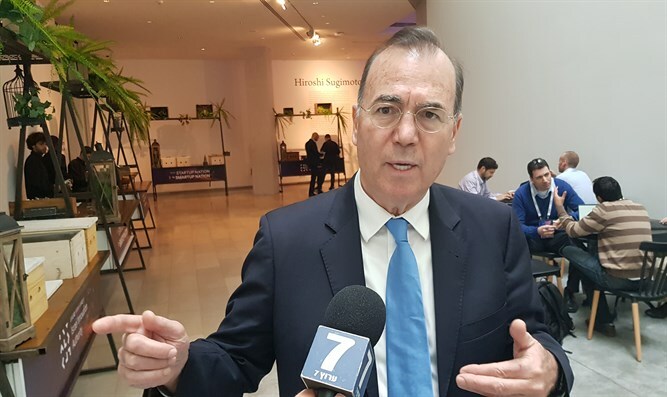 Economy and Industry Ministry Chief Scientist and Israel Innovation Authority Chairman Dr. Ami Appelbaum spoke to Arutz Sheva at the Tel Aviv Museum yesterday for a special conference hosted by the Israel Innovation Authority. Hundreds of business leaders, entrepreneurs, investors, government officials, and tech experts gathered to focus on the future of innovation in advanced countries, and how the tech sector can move beyond the basic start-up model to a more developed system promoting greater interaction between industry and innovators. "Israel has a few unique features," Dr. Appelbaum said, "First of all we have an eco-system that goes from basic research to applied research to start-up - a lot of innovation - and scale up for industry to keep going. Israeli innovators come with ideas that strike and surprise everyone who come across them. "[Second], Israel is known for their speed, that they work fast and can accomplish something that others take the much, much longer. "And last but not least, the innovation and the lack of fear. The courage to go and try. And if you fail, it's okay. You take the root cause of the failure, you take the consequence, and you move on. No-one will point a finger at you or single you out because you had a failed start-up. The other way around - now you know what went wrong, actually you can go up again. That's critical in the culture of the society," Dr. Appelbaum said.